This summer, iconic gin brand Bombay Sapphire has partnered with London’s newest luxury hotel, Rosewood London, to transform its alfresco terrace into ‘The Bombay Sapphire Ultimate Gin & Tonic Terrace’. Inspired by Bombay Sapphire’s 10 exotic botanical ingredients, the six week long pop-up experience will allow drinkers to celebrate he destinations from which the botanicals come and enjoy ‘The Ultimate Gin & Tonic’. Matchingthe elegant and distinctive design of Rosewood London, ‘The Bombay Sapphire Ultimate Gin & Tonic Terrace’ is the perfect spot in which to discover and experience an exclusive cocktail menu. Rosewood London has the feel of a stylish London residence, more akin to a British manor house than a hotel and is filled to the brim with a quirky collection of curiosities. Guests enter via a gated carriageway, which leads to the inner courtyard, where the ‘The Bombay Sapphire Ultimate Gin & Tonic Terrace’ will be situated. Bombay Sapphire’s journey of discovery will be brought to life in the re-design of the terrace that imitates the quality, detail and style of a bespoke yacht, showcasing an exclusively commissioned fabric design created by acclaimed illustrator, Jonathan Chadwick. The intricate pattern tells the story of the exotic botanicals and regions of origin that lie behind this renowned gin. On the Terrace guests will be able to enjoy a varied menu of cocktail twists based on ‘The Ultimate Gin & Tonic’ and go on an exhilarating taste journey through the Mediterranean, Africa, China and Indonesia. Watch out too for the the ‘Sense of Place Gin & Tonic Twist’, which draws on the shared British locale of Rosewood London and London Dry Gin for its inspiration as well as a selection of unexpected ingredients that give a nod to all things British. At specific times during the week, top Gintime friend Bombay Sapphire brand ambassador Sean Ware will be on hand to take guests on an interactive journey through the world of Bombay Sapphire. Cocktail lovers will have the opportunity to touch, smell and taste the exotic botanicals that have been vapour infused to create the unparalleled taste of Bombay Sapphire Gin. 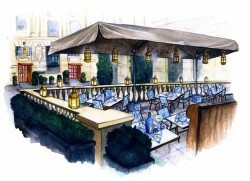 ‘The Bombay Sapphire Ultimate Gin & Tonic Terrace’ at Rosewood London will be open daily from 12pm until late, from Tuesday 22 July until Friday 29 August 2014. There will also be occasional live music that can be enjoyed at the terrace. ‘The Bombay Sapphire Ultimate Gin & Tonic Terrace’ is available for private corporate and event hire.